On Dec. 24, while you were all snug in your bed with visions of sugarplums delivering forced upgrades in your head…. and presumably politely waits for a reply, before installing Win10 1809. That isn’t what the sample dialog box says, but it is what the KB article says. If you’re currently running Windows 10 version 1507, version 1511, version 1607, version 1703 or version 1709, your computer detects the Windows 10 Update Assistant automatically. Then, you can expect to receive a notification that states that your device must have the latest security updates installed and then initiates an attempt to update your device. 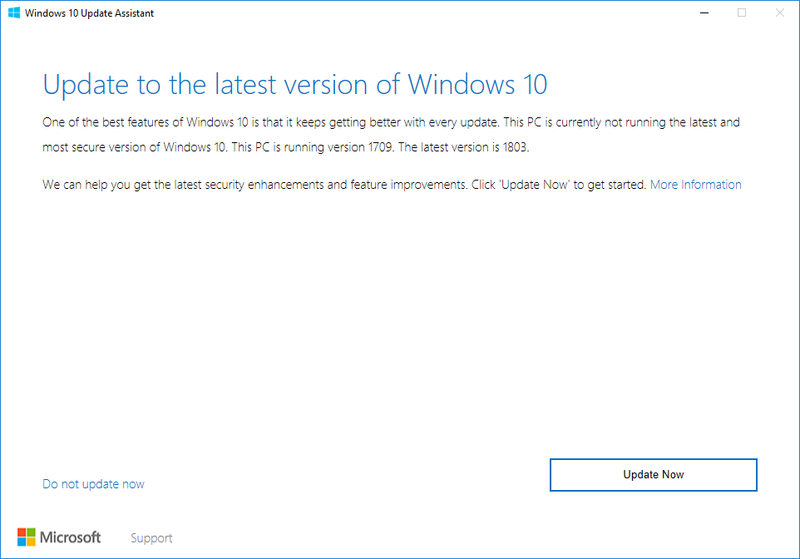 Of course, the update would be to version 1809. How does it work, exactly? Microsoft hasn’t told us, although the KB article includes a detailed multi-step procedure for avoiding the prompt. This process would bypass Windows Update settings and install 1809 without having to “Check for updates.” Not sure if it will always show a prompt or not. Microsoft’s timing couldn’t be better. Forced 1809 upgrades over Christmas — possibly with no warning. Unless you want to be pushed to 1809 on Microsoft’s schedule, block it. Block it good. SteveTree 3 months, 3 weeks ago. Those who are not seekers will be sought out. In addition to the actual behavior, most repulsive to me is the language in the popup in the screenshot. Microsoft is so certain it is doing you a favor, making your life better, and you should be grateful. … Demonstrably untrue and they know it–1809 was three months late for a reason. Look how dishonest that dialog box is: the “Do not upgrade now” option is a little link instead of an actual button, placed in an area where buttons are usually not put and users are not trained to look. Note how the X (close) button in the upper right is disabled. Also note how the “Update Now” button is already highlighted–just push enter or spacebar and this glorious largesse can be yours! It’s very likely, based on prior behavior, should you refuse their generosity, it will keep nagging every now and then until you give in or Windows Update just installs 1809 anyway. I’m done with Microsoft. I recently reverted from 10 1709 to Windows 8.1, and when it is no longer supported or I find acceptable Linux programs to replace the Windows programs I need, it’s off to Linux I go. Permanently. Fortunately I do not have to worry about my Christmas holidays being ruined by this idiocy as I am now done to 1 Windows install (7 not allowed on the Internet – ever). I am sorry for the poor souls who do have to deal with having their holidays ruined by this ongoing idiocy. What I am wondering about is when you set deferral to 365 days what happens when that time is up? I got a new Windows 10 Pro computer a year ago and used Group Policy to set it to 365 days deferred for feature update and to semi annual channel. So, will Microsoft update this computer to 1803 on day 366? If it was updated it would be to 1803 right (since 1809 is not semi annual yet)? I haven’t used Windows Updates at all during this year. I fetch the monthly cumulative update (and others) directly from Microsoft Catalog site. Microsoft tried about six months ago to upgrade this computer while I slept. My settings held and I did NOT get upgraded. Now the 365 days are about used up. Should I take the bull by the horns and upgrade it myself or wait and see what happens? (Microsoft should put a date on the Settings page showing either when the deferral was first set or when the 365 day deferral will be up). I believe the 365 days for 1709 will be up in Jan. (the 18th, I think). I have my doubts that 1809 is ready. If @zero2dash ‘s method holds, you should be able to set the deferral time to 230 days and pick up 1803 if you decide to go ahead with the upgrade. 1809 hasn’t been declared “ready for business” yet, but that may be coming with Jan Patch Tues. Be sure to hide 1809 if it shows up and clear the Windows Update queue so you don’t get a surprise. @zero2dash‘s method works very well. My 1709 was set to Semi-Annual Channel, feature delays 365, quality delays 0, no pause and in GP Windows Update was Enabled = 2. I left everything the same except I set the feature delay to 0 and 1803 showed up for install. Will let you know in a couple of hours how it goes. Didn’t get 1809 offered b/c it hasn’t been declared SAC yet. UPDATE: The upgrade went flawlessly. However, seems MS turned everything back on in Settings and Task Scheduler, etc. Good thing I took the machine offline before the reboot to reset my privacy before going back online!!!! Microsoft should put a date on the Settings page showing either when the deferral was first set or when the 365 day deferral will be up). Microsoft should do a lot of things. Knowing how Microsoft DOESN’T work to your advantage urged me to keep records, even if only small, dated ones in a text.doc that I keep on my desktop. If that text.doc should ever vanish, all I lose is a little faint ink. I am with previous commentators that has stated they have had (so far) no problems with 1809 I am a light weight when it comes to the all the tech savy persons on this site but I try to keep abrest and vigilant with Windows info. Come on, Microsoft. You’ve got to be out of feet and toes to shoot off by now. I think Microsoft is the real seeker these days. I’ll bet one day soon, that all PC’s with Windows will be updated without choice and without warning. Its almost there now, and unless your on Pro or Enterprise/Educational version you really have little choice now. I don’t think MS will push Win10 onto Win7 PC’s. For one thing, the hardware on many will not be up-to-snuff for Win10, and there won’t be drivers for the old stuff. They can’t just “ruin” the half of the Windows Users that won’t give up Win7. What they could do, though, is fix it so it won’t activate if you have to re-install. And they could remove the updates from the Catalog so you wouldn’t have access to the patches. And eventually, the old hardware will die and Win7 is blocked from newer machines. So, if you intend to stay on Win7, be sure you have SEVERAL images of the working machine(s) before it goes EOL and you keep them fresh periodically thereafter. I have an old old HP lappy that delivered with Vista. I put GWX Win10 home upgrade on it (previously had done a Win 7 upgrade) but had to hunt down an unsupported graphics driver for it. With that driver installed I haven’t been bugged/forced into any Win10 updates. OTH have another Dell XPS13 with Win10 Home and have always had metered connection set and was pushed into 1803, so assume its just a matter of time before 1809 shows up. It doesn’t often get rebooted so may actually be laying in wait. No problem for W7 users . Just install Steve Gibson’s freeware “Never 10”. Do we have to go through this again in a few months time with 1903? I imagine a group standing around helping at a car crash on a highway, while more traffic approaches destined create more accidents. Surely M$ would like a year off like the rest of us. Not only that, but Windows 10 users will always be getting the upgrade nags frequently unless they are on the latest “bug-infested” version. A lot of people will be migrating to Linux because of this. Along with the proposed monthly subscriptions for all Windows 10 users, Microsoft’s marketshare is headed for a freefall. Microsoft has at no point indicated that they’re looking at monthly subscriptions for Windows 10 for home / pro users. Not even a sniff. If you’ve heard it somewhere, it’s media speculation and nothing more. Microsoft might introduce a home version of “Microsoft 365” that includes OneDrive, Skype, backup storage, but no Office, for a few bucks a month….. but it’s almost impossible to see them start charging for feature updates at this point. Apple stopped charging for new features with the OS X Mavericks release in 2013, and Microsoft joined them in 2015. Why change now? Yeah, they’re giving up billions in theoretical revenue over time. You could say the same thing about Visual Studio Code, but that hasn’t stopped Microsoft, has it? Even in business environments, the subscription models they’re doing are mainly for high-end business security like centralized hosting/virtualization of individual applications, Azure-hosted Active Directory, running Windows Defender in a separate VM, and some crazy “block at first sight” antimalware technology that can provide faster protection than waiting for daily definition updates. They’ll pony up for all that crazy stuff because their business depends on keeping Windows secure, and businesses tend to be directly targeted for attacks a lot more than home users. Really feel for those who are going to be hit by the Windows 10 upgrade train again, especially the Windows 10 Home users. If I am forced to use Windows 10 (LTSC only) in the future, this will be the first thing I will do before unblocking internet access on a new installation of Windows 10 : Launch the Group Policy Editor (gpedit.msc), go to Computer Configuration > Administrative Templates > Windows Components > Windows Updates, select “Configure Automatic Updates”, and select “Disabled”. As far as I know, this will disable Windows Update and no updates will be downloaded automatically, including those Feature Updates, for as long as the policy is in effect. It should work in all versions up to 1809 at this time, but it will not work in the Home version since it does not have the Group Policy Editor. After disabling Windows Update, I will just manually download any necessary updates and install them when I want to, NOT when Microsoft wants me to. I am used to this since I am using the Group B way of updating so it will not be a problem for me. I love your optimism Mr Bond, and I hope I’m wrong, but my experiences are that Win 10 has all sorts of processes that ignore GP and force updates. My only solution was to break the updates to stay at 1709, and have a dual boot and a VM with the newer versions so if something won’t run, it can be installed there. I don’t need the security patches as my 1709 is over the top with security apps and backed up. I will deal with any instance of Microsoft ignoring this “Disable Updates” policy if and when it comes. As far as I know, no violations of this “Disable Updates” policy has been reported. I am aware that other policies like “Defer Updates” has been ignored in the past. In newer versions of Windows 10 like 1803 and 1809, setting this “Disable Updates” option and Windows Update will report that “some settings are managed by your organization” and it has been disabled. I saw that in virtual machines myself. I will keep an eye on whether Microsoft will mess with this policy in the future. Actually, I don’t have to deal with Windows 10 at present as I have purposely avoided Windows 10 on all of my computers save one (That one is a Ryzen that has Windows 7 / Windows 8.1 / Windows 10 1507 LTSB / Windows 10 1607 LTSB installed. The Windows 10 partitions are used for testing purposes only.). I know about this “Disable Updates” policy by testing them in VMware virtual machines, and so far I have seen no violations. No updates of any kind are automatically downloaded, including the Feature Updates, once this policy is in effect. I will stay away from Windows 10 for as long as possible. I would update from 1803 to 1809 if I were certain 1809 was stable and closer to problem free. All the problems with the roll out and storage issues have made me nervous about upgrading to it. 1809 has been the most problematic version of Windows 10 that Microsoft has released. It’s disappointing. Question: would disabling the “Check for Updates” button be useful to prevent accidental “Seeker” status? This ‘AskVG’ article explains how to disable the button using the Group Policy Editor and also the Regestry Editor, but I am not sure if this would work on “Home” editions. I have Win 10 1803 Pro and it is set like zero2dash settings with no problems. Maybe someone with Home edition can see if the Reg edit from AskVG might be helpful? You don’t have access to Group Policy in the Home Edition. And sometimes the settings under “Policies” in the Registry don’t work for Home either. You don’t have access to Group Policy in the Home Edition. I haven’t bothered playing with it but have seen it only installs the basic framework with no policies. I may get back to it eventually when I strike something I want that cannot be done via Registry. Life delivers so many options and so little time. It (Group Policy) doesn’t work right (in Home Edition). Thanks. That may save me some time.